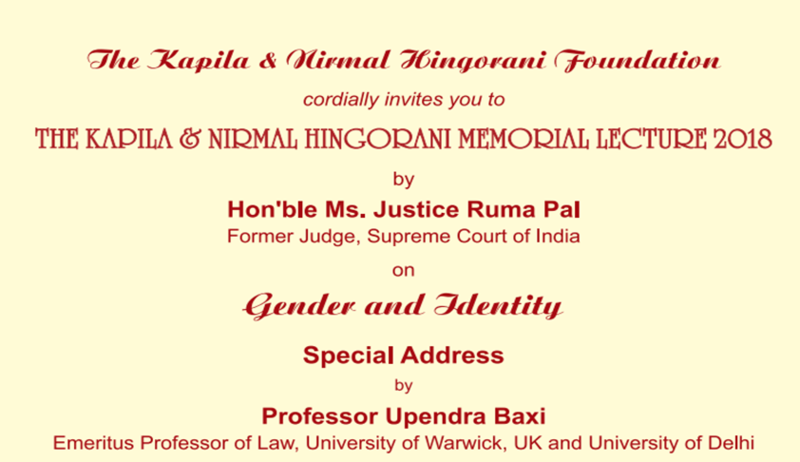 The Kapila and Nirmal Hingorani Foundation has extended invitations for the Kapila and Nirmal Hingorani Memorial Foundation Lecture, 2018. The lecture will be delivered by Justice Ruma Pal, former judge, Supreme Court of India. The lecture will be on the theme ‘Gender and Identity’. Special addresses will be delivered by Prof. Upendra Baxi, D. Sonal Mansingh, and Ms. Lillette Dubey. Tea would be served at 4:30 pm.